I don't know what it is, but December brings on the urge to travel. Maybe it's the cold weather or maybe it's the holiday atmosphere. Last year I spent New Years' eve on a cold white mountain in Colorado. This year I opted for not so frigid an affair and decided to visit the Galapagos Islands off the coast of Ecuador. But being a mountaineer, one must keep one's priorities straight, so I ended up spending only three days in the Galapagos and the rest around snow-capped volcanoes in the mainland of Ecuador. The Galapagos Islands hold a very special place among the followers of Darwin. It is here that Darwin drew observations leading to his controversial book "The Origin of the Species". Darwin's vessel the H.M.S. Beagle docked in these equatorial islands on September 7th, 1835. Thus were the Galapagos Islands forever linked with the theory of evolution by natural selection. It was exciting to visit such a hotbed of controversy. However, I do not buy Darwin's theory simply based on the existence of several species of animals. Stain glass window on Panccillo Hill, Quinto. But was I dumbfounded at the spectacles I saw? Yes! 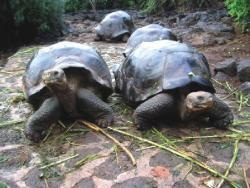 Giant tortoises that weigh about 500 pounds and measure 6 feet from head to tail! Friendly dinosaur-like iguanas roaming around the islands munching on cactii. Blue-footed Boobies (a species of bird with blue feet and blue beaks) diving for fish. And of course, the sea lions are extremely playful and cute. Snorkeling in the waters, I saw several schools of colourful fish. It was truly an enchanting experience. The main city of Puerto Ayora itself was fascinating. At night the electricity can stop, as it did one night while I was out and I walked to my inn in pitch black. Thank goodness the islands are safe and relatively crime-free. The experiences here were indeed unique. The people are also extremely friendly. When I arrived at my hotel, the Red Mangrove Inn, I had one hour before my tour boat took off, and Mercedes the office manager lent me her bike to make a dash into town to have a quick lunch. round climate that's pleasant. Because there are many plateaus and mountains, the temperatures do vary, depending on what elevation a person is at. Giant tortoises in the Galapagos Islands. The first day in Quito we visited several churches. Ecuador is called the "Church of South America" because of it's numerous churches. We visited about five churches in the morning, including the famous Church of San Francisco of Assisi. After that we visited Panecillo Hill upon which rests a giant statue of the Virgin Mary. 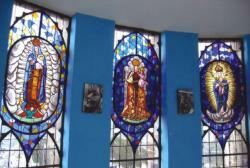 The stain glass windows inside were remarkable and the view of Quito from this hill was amazing. But our city-life was short-lived. The next day we embarked to climb Rucu Pichincha 15, 700 feet, a dormant volcano. We were promised a super-bus to transport the fourteen people up a dirt road to the trailhead. We were given a tour bus, with no special features, but it came with an awesome driver. But the road was so rutted that even he gave up and we started our climb about 600 feet lower than planned. It proved to be a longer day, but we had 3 more mountains to climb, so the extra work was good training. The next day we visited the monument at the equator. The equatorial line is clearly marked and having one foot in the Northern and the other in the Southern Hemisphere was fun. We visited a museum at the equator too. I balanced an egg on a nail at the equator, in about two minutes. Having had our fill of sight-seeing we were once again off to climb another mountain. This time we were headed to Illiniza Norte 16,818 feet. The approach to this mountain was a windy dirt road. We had the right vehicle to get to the trailhead, four-wheel drive pick-up trucks. Being in the back of a truck is an essential South American experience. We hiked up to a hut on the mountain. There was space for about 20 people inside the one room hut. Somehow there was a large group of Austrian and German climbers who had shown up without a reservation. The hut-keeper had the mercy to let them stay, however, can you imagine 40 people inside a hut with bunks meant for 20? Going to the bathroom in the middle of the night meant tiptoeing through a floor full of European bodies. Tricky. Early morning we headed up the mountain in extremely windy conditions. There were a few sections of heinous drop-offs but our main guide Marcos fixed ropes along some of these and we used the ropes for added protection. Making the summit of Illiniza Norte 16,818 feet felt great. The view from the top was amazing. The next day was a shopping day. We headed to the markets of Otavalo, the largest conglomeration of markets in South America. The most remarkable thing about this town were the inhabitants. Most of the men had long hair and the women wore traditional dresses and they wore elaborate gold jewelry around their necks. 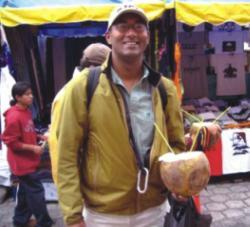 My prized purchase in Otavalo was a drink of coconut water straight from the coconut with a straw. I had a bout of major nostalgia. I felt like I had been transported to the streets of Dhaka. We soon left Quito and drove south along the Pan American Highway. Another name for it is the Avenue of the Volcanoes. Several volcanoes are visible from here Cayambe, Cotopaxi and Chimborazo. We drove to La Hacienda Cienega, a beautiful resort nestled in the foothills. This idyllic resort is self-sufficient and even has its own farm. At dinner we were entertained with a local folkloric band singing Spanish ballads. Our next climb would be Cotopaxi 19,300 feet high. This would be much higher than the other mountains and it proved to be quite a challenge. 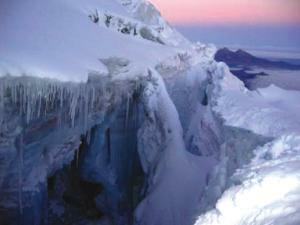 The most remarkable thing about Cotopaxi was how heavily crevassed it was. 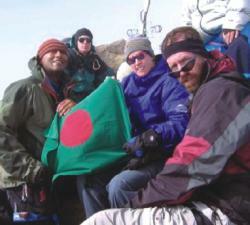 I remember one part of the climb where I was on a foot-wide snow bridge crossing a gaping crevasse with deep drops on either side. With one giant leap of faith I made it across. But this was one of many and it made for quite an exciting climb. After climbing Cotopaxi we headed to the town of Banos surrounded by waterfalls and hot springs. Looming over Banos is Tungurahua a very active volcano that spouts ash every now and then. A few years ago Banos had to be evacuated due to volcanic activity, but since then, people have returned and things seem to have settled down. Banos was my favorite town in Ecuador. A small town at lower elevations with colorful people and colorful buildings. Everyone seemed to be in a relaxed holiday mood. We rode on the open top of a double-decker bus to see several waterfalls. The most prominent of which was Pailon del Diablo (Devil's Cauldron). It was spectacular and the force of the water was incredible. After a couple of nights in Banos we were off again to climb Chimborazo at 20,700 feet. Three of the climbers had had enough and were off to the Amazon jungle instead. I resisted the temptation to join them and stuck with the program. It was yet another breathtaking experience. It was great being on a glacier in the middle of nowhere and seeing the sunrise, revealing all the other mountain tops around. There is really no way to describe this feeling in words. After our climb, we spent one last day in Banos and then returned to Quito to catch our respective flights back. I was quite sad to leave. The nineteen days in Ecuador had been extremely enjoyable. I think what struck me most about Ecuador was the richness and variety in this small nation. Where can you snorkel with beautiful fish one day and climb a snow-capped volcano another? Ecuador. The writer is a Senior Product Engineer and Adjunct Math Faculty in Silicon Valley, USA.